In the 19th century Britain women were expected to marry and have children. The laws in Britain were based on the idea that women would get married and that their husbands would take care of them. 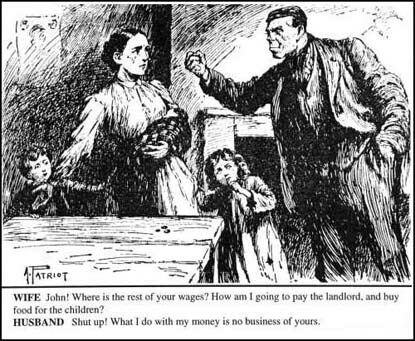 Before the passing of the 1887 Married Woman’s Property Act, when a woman got married she could not own property, even inherited property, and her wealth was automatically passed to her husband. If a woman worked after marriage, her earnings also belonged to her husband. Census figures show that there was a shortage of available men. This would have been due to the mortality rate for boys being far higher than for girls; a large number of males served in the armed forces abroad and men were more likely to emigrate than women. By 1861 there were 10,380,285 women living in England and Wales but only 9,825,246 men. On marriage she became the chattel of the man. However, a husband was also considered to be responsible for his wife's debts since, as she owned no property, she couldn't get into debt on her own account. Since a wife was considered to be under her husband's authority, he would most likely be blamed for any crime committed by his wife, since she was assumed to have acted under his direction. The idea was that upper and middle class women had to stay dependent on a man: first as a daughter and later as a wife. Once married, it was extremely difficult for a woman to obtain a divorce. The Matrimonial Causes Act of 1857 gave men the right to divorce their wives on the grounds of adultery. However, married women were not able to obtain a divorce if they discovered that their husbands had been unfaithful. Once divorced, the children became the man's property and the mother could be prevented from seeing her children. A divorced woman had no chance of acceptance in society again. The wife could not make a contract. If the husband wished, he could confine her against her will until 1891. If the wife committed a crime, it was the husband who was responsible. If the wife entered into debt, again the husband was responsible. Until 1857, divorces were only possible through the Church of England. Divorce was difficult to obtain. The 1857 Divorce Act “liberalized” the allowed reasons for a divorce. Men could now get a divorce for adultery. Women needed adultery plus another action, such as desertion for two years or physical cruelty. Even in the UK, before Independent Taxation was introduced in 1990, the income of a married woman living with her husband was treated for Income Tax purposes as his income and he was responsible for her tax !